Magazine and newspaper readers are looking for their favorite titles on their iPads and publishers have to respond quickly. This is why Magazine Subscriptions help shape publishing industry nowadays. There are several reasons why magazine and newspaper publishers adopt Magazine Subscriptions so fast. Firstly use of Magazine Subscriptions helps them get closer to the readers. This is job number one for publishers really – just get to as many readers as possible, with a content as good as possible. And Magazine Subscriptions help them do that. Secondly spending money on IT department doesn't seam like a viable idea with today's economy. 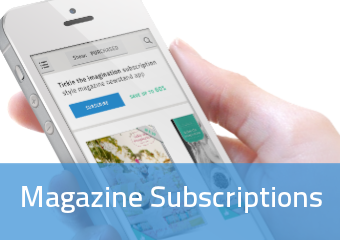 Magazine Subscriptions help reduce cost significantly both in terms of time and money. Lastly publishing in general is very competitive market. When you add costs and time of developing your own iPad and Android applications it just doesn't make any sense. You would end up loosing a lot, while your competitors just grow. Why publishers need Magazine Subscriptions? Publishers of all sizes can benefit from using Magazine Subscriptions in their day-to-day workflow. For one going mobile enlarge number of ways readers can access your publication. Secondly publishers that previously were operating only locally now can reach new markets without enormous costs of doing so 10 years ago. Lastly publishers can be one of the first in their category, therefore gain significant advantage over late adopters. This is not only limited to big publishing companies. Introduction of App Store Newsstand and Google Play newsspaper and magazine categories allowed small publishers compete with big companies on equal rights. Final call is made by readers around the world. They vote with their credit cards. Use of Magazine Subscriptions and fast adoption of iPads and Android tablets democratize publishing market and help small and medium publishers in a way that was simply not available to them few years ago. How Magazine Subscriptions can help you grow? Every magazine publisher wants to grow. This is particularly hard in todays economy and with a limited resources. Fortunately there is an easy way to significantly enlarge markets that your company address – and this is mobile. While going mobile may sound tough it really isn't with a help of Magazine Subscriptions. Publishers can test mobile markets spending very little money comparing to building custom solution. Therefore reach new people and grow! PressPad is a great example of Magazine Subscriptions. With an easy to use interface, no software to install and quick response time Publishers can deliver dedicated applications to App Store and Android market in a matter of minutes. PressPad is free to try and no long-term commitment is necessary.